With a title like ‘Superheroines And The Epic Journey’, I did wonder if author Valerie Estelle Frankel was going the Joseph Campbell route and indeed she does. 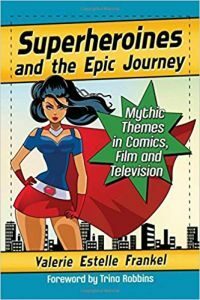 However, there is a wealth of information about a variety of super-heroines and their comicbook stories as she explores them in seven aspect chapters. If anything, I ended up being curious who she didn’t cover and was regularly checking the index. As the sub-title shows, Frankel covers ‘Mythic Themes In Comics, Film And Television’, so she has a wide brief. There are some confusing areas. She rarely distinguishes which company any of the characters belong to so you might need some background knowledge youselves. I know there’s a problem with how do you distinguish science from fantasy with super-powers but to call them all supernatural, which is essentially fantasy, does cause a problem because the comicbook writers certain distinguish one from the other. Something else that tends to hit my attention is how much research is done. Frankel covers the ‘Wild Cards’ book series but her focus is on the recent books than the earlier volumes. Granted if you’re writing a book to a deadline that you’re not going to read all and there was 15 not 12 in the original run when you combine Bantam and Baen books. Her bibliography is certainly a long one. The same also applies when addressing the Legion Of Super-Heroes where the 30th century also has other teams. Life Lass actually belongs to the Heroes Of Lallor and no reference to her team mate, Gas Girl. Certainly, Light Lass, who is a Legionnaire, has a flight ring but so does all the team but it doesn’t evoke her power as she directs it at other objects and people. Covering so much ground doesn’t mean these things shouldn’t be checked. The LSH is a somewhat unusual large team but it also has a high proportion of female characters and only a few are explored. When it comes to the female equivalent of male heroes with similar costumes, Frankel misses out All-Winners Squad/Invaders member Miss America (Madeline Joyce) who not only wears red and a cape but glasses as well. Unlike Captain America, she actually had super-powers as well. Hardly a female equivalent and not even a match for a beauty queen. She must surely have come across her as she references Spitfire. It wasn’t until the last chapter that Miss America gets a name mention. Occasionally, Frankel will note the super-heroines creators but not how many were by men and how few by women, so there is a jaded look from the start in how super-heroines are depicted. It might have helped to compare male and female writers on the same characters. Just in case no one thinks I’m paying attention, with the ‘Dark Phoenix Saga’, Jean Grey wasn’t going to marry Sebastian Shaw as he was portrayed as the vicar, but actually Jason Wyngarde. Her examination of Invisible Girl/Woman from the Fantastic Four tends to ignore the fact that she can also generate force fields and in FF#17 in the 1960s, she beat Doctor Doom on her own, although I do have to wonder how Reed Richards taught her martial arts as he rarely uses it himself. I should point out that catching every single super-heroine is a mammoth task and she does cover more than a majority. However, when only a couple or less members of a team with others being significant as well then the research hasn’t gone far enough. Stirring them all into a mix for comparison is going to cause your head to spin a lot while reading this book. If you do know the subject, then there should be more than potted synopsises all the time but some proper analysis. Some surprising significant omissions: Daughters of the Dragon: Misty Knight and Colleen Wing; Shanna The She-Devil; Miss America (Madeline Joyce) as mentioned; Namorita (although Namora is covered), the Silk Spectre mother/daughter from ‘Watchmen’ and even Vampirella – despite her costume designer Trina Robbins designed her revealing costume and wrote the introduction. The plus side is if you’ve never come across the characters she has explored then you’ll want to check them out. It would be interesting to see if Frankel would explore female supporting characters and how they come across in a follow-up book. There can’t be that many. Do they simper or have they broken out of the mould? Likewise, because of the nature of the mix, it would have been interesting to track how particular characters have evolved with different writers and formats. I should point out that the release of this book was prior to the ‘Wonder Woman’ film. I do think Frankel should have done more than recount particular tales and then express the opinions of others than herself. The last isn’t strictly true because she even quotes herself from a previous book. An author’s opinion is important and shouldn’t just be left to the conclusion. If you took away the potted histories from the comicbooks, there wouldn’t be much left. « Zombie Apocalypse: Endgame by Stephen Jones (book review).